Ancora successi ieri sera per la conferenza di Luca Volpe al Derby Magic Circle! Wonderful lecture yesterday night at the Derby Magic Circle! 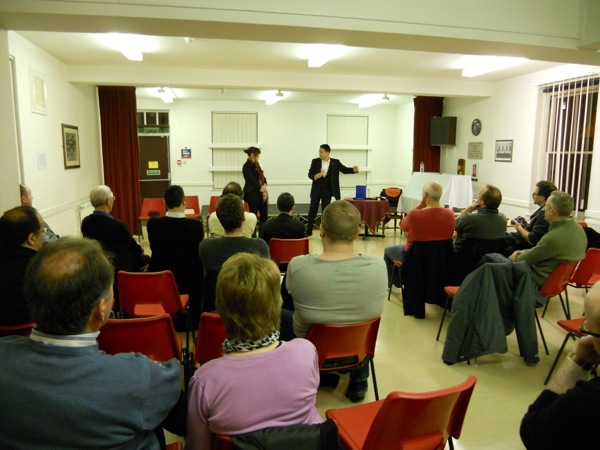 Luca Volpe presented his ‘Lecture Show’ to Derby Magic Circle on 23rd January, 2013. This was quite a unique experience for us. Usually we are shown a couple of routines and then these routines are explained in detail for us. What Luca did was performed the whole show, not only did we see Magic happen, we experienced the Magic. By being part of the audience and taking part in the show, we could feel how our audiences would feel performing Luca’s routines. The routines were beautifully constructed and Luca presented them professionally. After the show we had a short interval, then Luca explained the ‘how to’ of all the routines. His explanations were very thorough, every little subtlety was explained in detail. I totally enjoyed the evening and have the utmost respect for Luca, the Italian Mentalist. Grande successo per la conferenza di Luca Volpe all’ IPSWICH MAGIC SOCIETY un grande inizio per la ripresa del lecture tour che durera’ fino al 5 marzo. 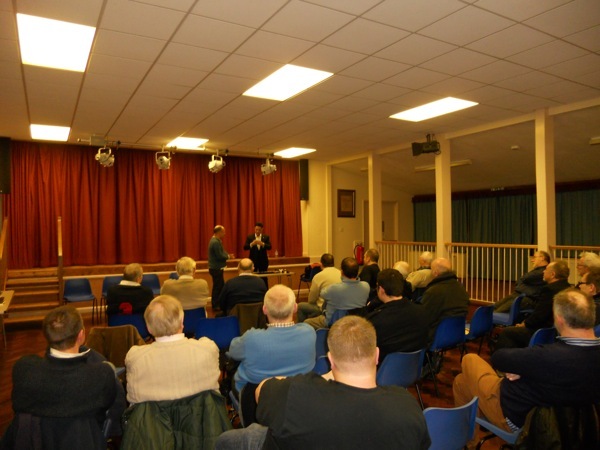 Great succes for the lecture at the IPSWICH MAGIC SOCIETY, was a great start for the reprise of the lecture tour which will end the 5th of March. Luca Volpe’s lecture was one I had been looking forward to for a long time. There aren’t that many full time mentalists on the lecture circuit these days and finding one so prolific in ideas and so willing to share them is a rare treat indeed. The lecture was split into two halves. The first half was performance only and Luca presented us with six effects from his working repertoire. There was nothing light about these effects either, they were all strong workable pieces of theatre full of subtle nuances that made each piece both mysterious and entertaining. The best thing for me about the routines was how adaptable they all are to work with any style we choose to adopt. The second half was all about the explanations and for this Luca left no stone unturned. He went into great detail talking about the effect, his thought processes, the subtleties involved and his justification for doing different things. This would often take the effect to a different level. It was quickly apparent that Luca is someone who cares passionately about his work. It was a real pleasure to see the lecture split up in two halves in this way. So many lecturers stick to the old “show one, explain one” format, and whilst we can often learn just as much like that, what you miss out on is the overall flow of the effects and consequentially I believe by doing it in two halves, you not only can get a much better understanding of how they can play in the real world but you get the bonus of being able to watch a live performance from a true professional and mark my words, Luca Volpe is a true professional. One of the bits and pieces he was selling on the night was a DVD of the lecture, which had the added bonus of not just a reminder of what had been seen during the night, but the performance part on the DVD was to a “real” audience. I only mention this because Luca didn’t bring it up during the lecture and I think it is a strong selling point. Unsurprisingly the lecture attracted a lot of attention from visiting magicians from surrounding magic societies, however I suspect we would have had even more present if it wasn’t held on a day of heavy snowfall . All in all I think it was a thoroughly enjoyable lecture and one which I personally took a lot away from. I took copious notes all night which is always a sign of a great lecture (often my note book is still blank at the end of the Evening). Luca Volpe premiato dal grande SILVAN all’UNICORN di ROMA di ASCANIO. Luca Volpe presenterà il suo seminario sul mentalismo il 23 Marzo. 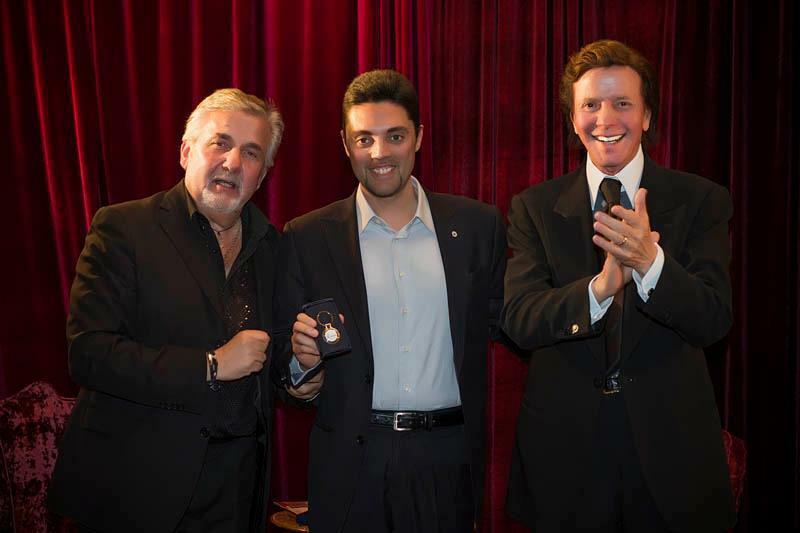 Luca Volpe awarded at the UNICORN in Rome with the famous Italian illusionist SILVAN. Luca Volpe will present his lecture IN MY MIND the 24th of March. Luca Volpe sarà ospite al “Conjuring at the Court” a Londra dove presenterà parte del suo show il 31 Gennaio. 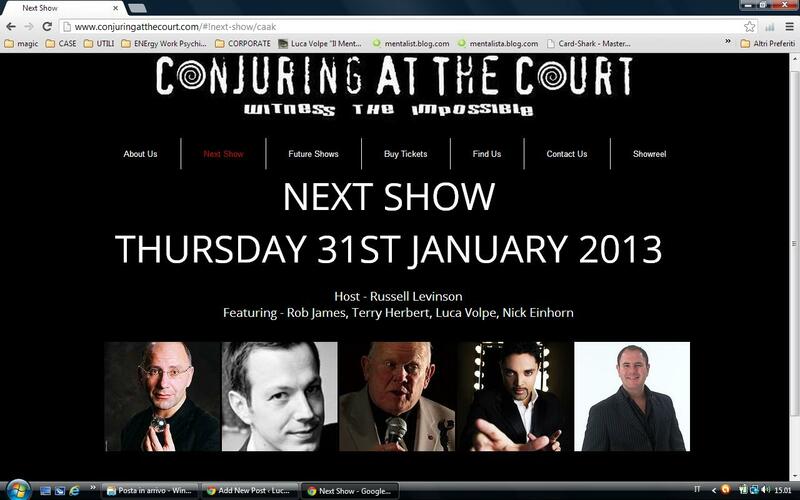 Luca Volpe will be performing part of his show at the “Conjuring at the Court” in London the 31st of January.